Which is why I love the jewelry and other products from Boutique Academia. Maile, the owner, is a friend I know personally from the time when Hubby was working on his PhD from UC Berkeley, and she has incredible taste. 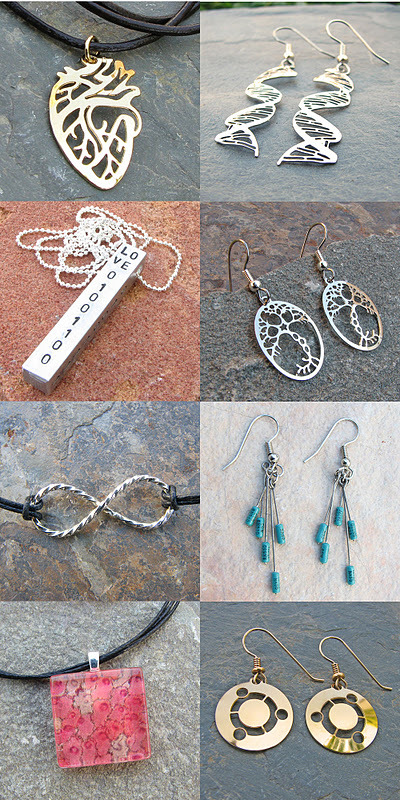 The Binary Love Necklace...with LOVE written in binary code. The Anatomical Heart Necklace would be awesome as well. Anyone familiar with the Infinity symbol will know why either of these Infinity Bracelets would make a perfect Valentine's gift. Or even if you're not a huge science geek, you can still enjoy the beauty of these Glass Tile Rose Petal Cells Pendant. These flowers will never wilt or grow old. If you're not the math or science type, but love Harry Potter as much as we do, you might like a Deathly Hallows Necklace (which is currently out of stock, so you can drop the hit for this one for your birthday, Mother's Day, or I-Can't-Believe-You-Forgot-Valentine's-Day). And as you can probably guess...I tend toward showing off Boutique Academia's Pendants and Necklaces because I don't wear earrings. 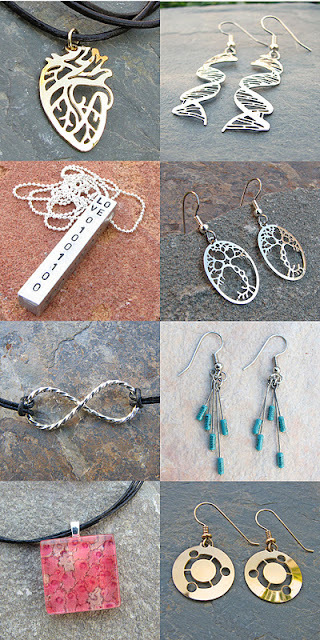 But you'll want to be sure to browse Maile's selection of unique earrings as well. Now if you'd like to win a $20 gift card to Boutique Academia, all you need to do is go to this Facebook post and leave a comment...that's all you have to do to enter. You can also get a second entry if you share the contest with your friends. And while you're there, be sure to "like" Boutique Academia on Facebook so you can be notified of new products and contests, as well as all the fun science and math links that Maile shares.